Spring is here and the harbor is truly coming alive—boats are returning to their moorings, people are creeping out to bask in the sunshine and the hydromedusae are blooming. This is a hallmark of spring that aquarist Jackie Anderson always looks forward to! back to the holding tanks behind the scenes at the Aquarium. Jackie is one of the people who takes care of the jellies that you see in the Aquarium. 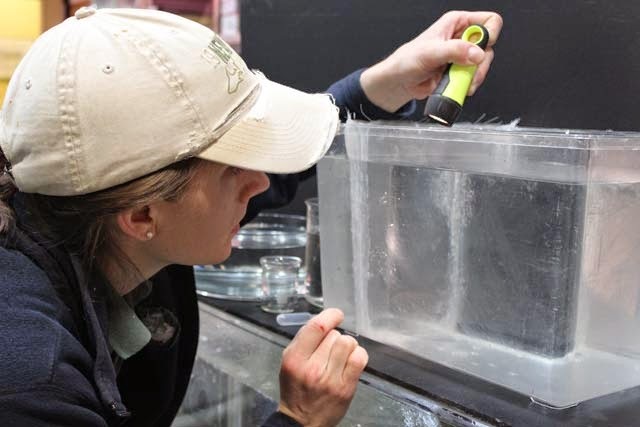 She's also the force behind one of our newest exhibits—the fleeting hydromedusae display near the Edge of the Sea tidepool touch area. 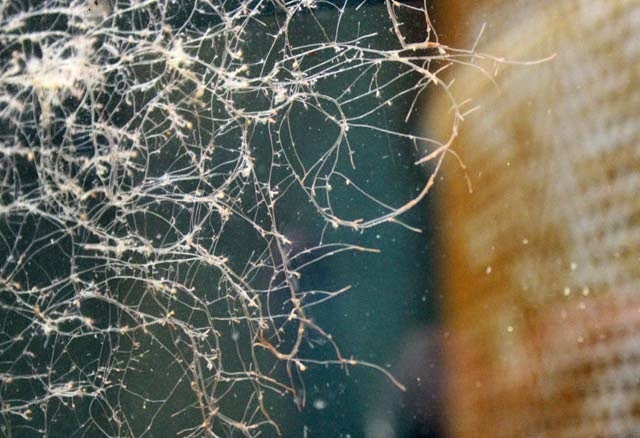 Hydromedusae belong to a group of animals that are classified as Cnidarians. Cnidarians include corals, anemones and jellyfish. Hydrozoans begin life as a stationary hydroid (more on that later). 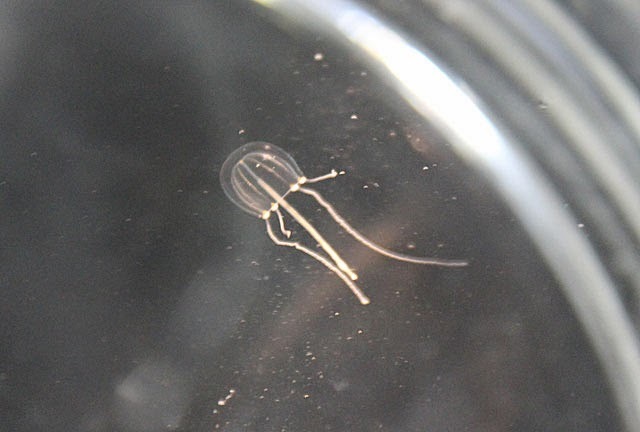 Some species remain in this stage, but many others can release free-swimming jellies known as hydromedusae. In the free-swimming stage, they can look very similar to some of the jellies you see at the Aquarium with the bell shape and tentacles flowing beneath. 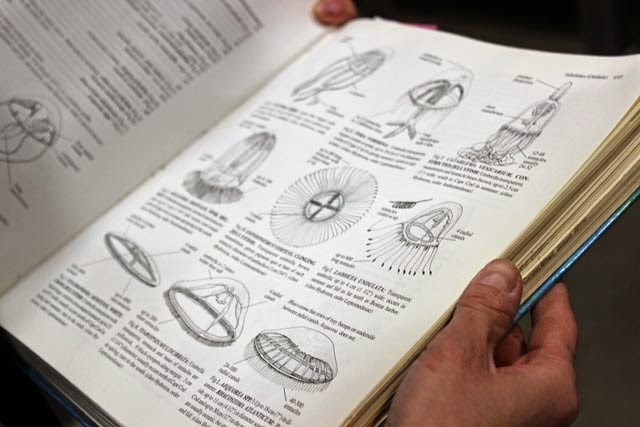 To get around, these animals pulse just like a sea jelly, too. However, they rarely grow larger than your fingernail and most are nearly translucent. 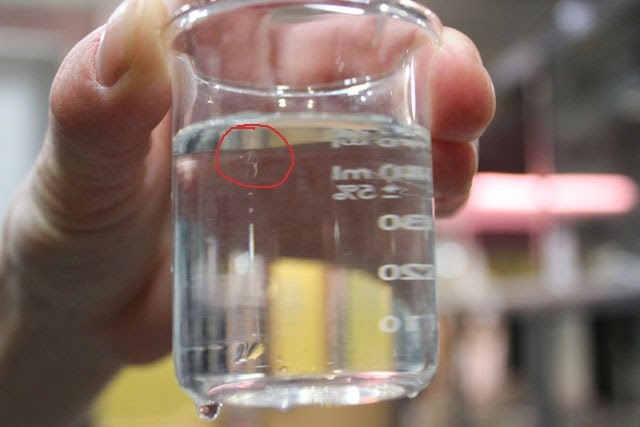 See they tiny jellyfish-like swimmer in the beaker? 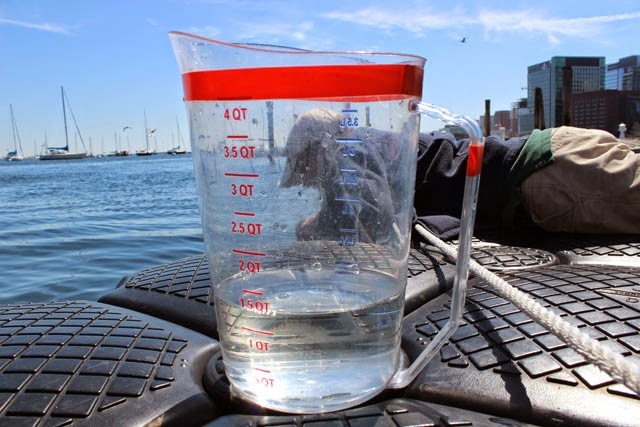 Jackie has been monitoring Boston Harbor for these fascinating gelatinous zooplankton and has been collecting some for display. "I'm fascinated by these animals," she says. "I want to be able to show other people that they are a part of our local ecosystem, you just have to look closely." One type of hydromedusa that we often see this time of year is Sarsia. They have the usual bell-shaped umbrella, with four canals and four long tentacles and a mouth-like clapper hanging below. They reach a maximum of only 18 mm high! We also see what is likely Tiaropsis. These are flatter shaped and look more like miniature moon jellies. which are the little nubs along these filaments attached to the glass. There's still a lot to learn about these tiny seasonal neighbors of Boston Harbor. 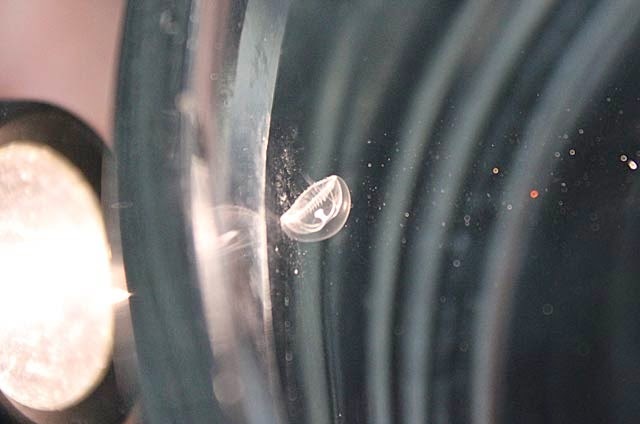 Come by the Aquarium and see if you can spot these ephemeral jellies in our special exhibit. Or if you're near the shore this time of year, look closely. You might see a glint of tiny tentacle flitting across the surface. 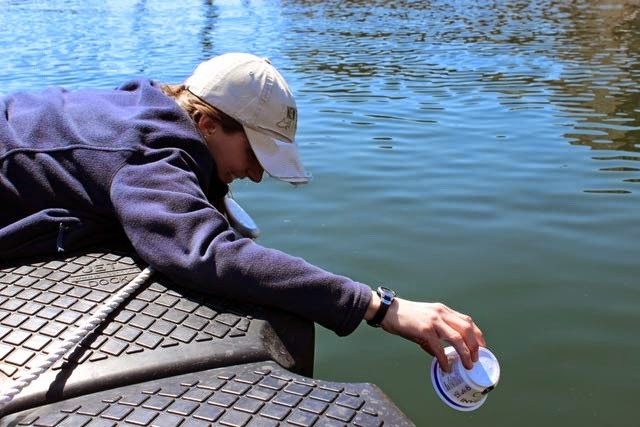 Flat-calm water, a good eye and a trusty scoop is what you need to spot the hydromedusae in the water.